The third book in the series "Harry Potter and the Prisoner of Azkaban". The translation is by Wiebe Buddingh and the illustration by Ien van Laanen. 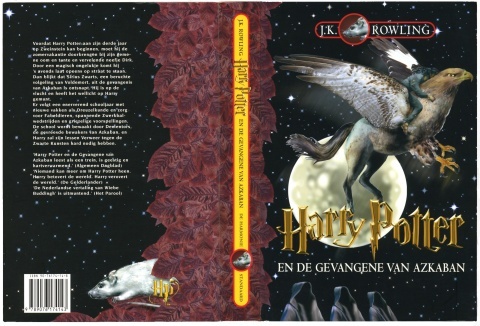 The cover of this soft back version has a picture of a Hippogriff which I assume is Buckbeak. There's a person sitting on its back but they don't resemble anyone I can think of, as they appear to be slightly green with blue hair. There's also a large full moon in the background - a connection with the werewolf - and three dementors looking up from below. The back cover has a large rat on which must be Scabbers, and has a leaf border around some of the edges. Harry Potter en de Gevangene van Azkaban, translated by Wiebe Buddingh, illustration by Ien van Laanen.